Kitchen renovations are among the most popular home remodeling projects in the U.S., and their costs can range quite widely, depending on the work done as well as the part of the country. 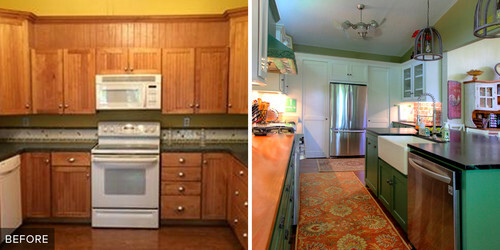 To get a sampling of projects across the country, we asked Houzz readers to share their kitchen renovation stories. 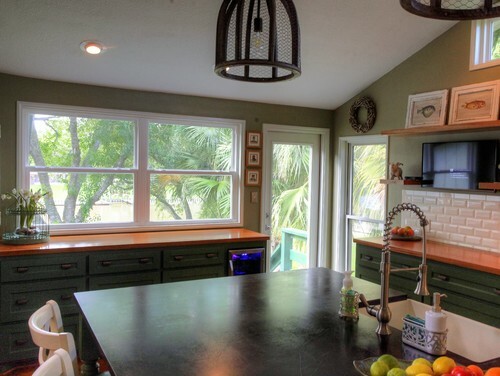 Here, we profile a full remodel of a kitchen in a fishing town near the Gulf of Mexico for about $61,000. BEFORE: Three years ago Andrew and Debbie Nelson traded a busy life in Houston for a slower pace in Sargent, Texas, a fishing town about two miles by land from the Gulf of Mexico. They bought a split-level home, planning to remodel the kitchen. Debbie Nelson spent about two years poring over photos on Houzz, visiting showrooms and gathering information. Ultimately, the Nelsons decided to expand their kitchen into the adjacent sunroom, and to expand the opening into the adjacent dining room. 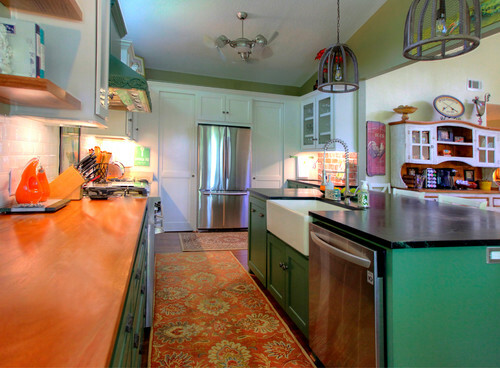 AFTER: Here is the renovated kitchen. The wall with the angled roofline is the exterior wall that formerly formed part of both the kitchen and the sunroom. The wall at the right of the photo, with the stainless steel refrigerator, is where the yellow oven and microwave wall stood prior to renovation. The remodeling changes just about doubled the size of the Nelsons’ new kitchen. The angled roofline was part of the home’s original structure that the Nelsons took the opportunity to expose. The couple installed clerestory windows on the back wall; they function more like skylights due to their height. The window location meant the Nelsons could still take advantage of some of the vertical space for upper cabinetry. The kitchen’s clerestory windows echo similar windows in the adjacent dining room. Here is another angle showing the widened opening to the dining room. The wall at right is all that remains of the sunroom wall. The Nelsons knew they wanted wood countertops for the perimeter of the kitchen and let their contractor choose the type of wood. He selected a rich African mahogany, which he left unfinished and sealed with several coats of polyurethane. 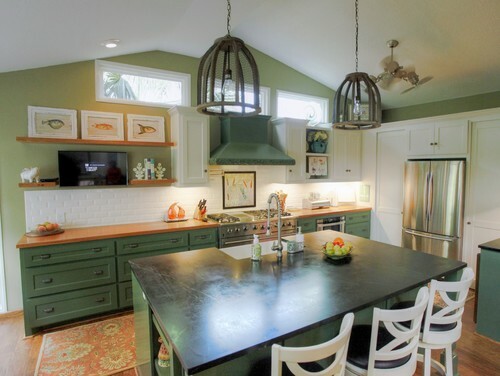 The island and wine bar area counters offer a contrast with dark, dramatic soapstone. “Uh-oh” moment: Originally, Debbie Nelson estimated that she’d need a 6-by-5-foot kitchen island, but when she taped out the plan, after demolition, she realized she had miscalculated. “It was at that moment I realized in order to include my dishwasher, farmhouse sink, garbage drawer, drawers and storage, the island needed to be 7 feet by 5 feet,” Nelson says. Ultimately, this change meant the opening to the dining room had to be enlarged. 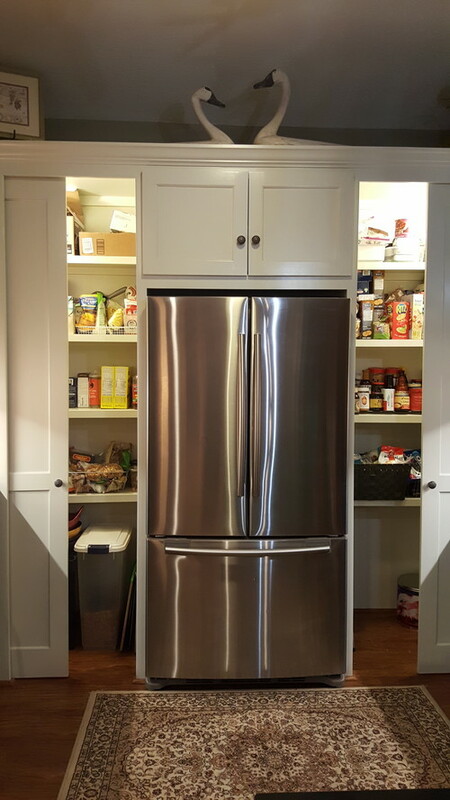 On each side of the stainless steel refrigerator, the Nelsons had pantries installed. Here they are with doors slid open to reveal their storage. 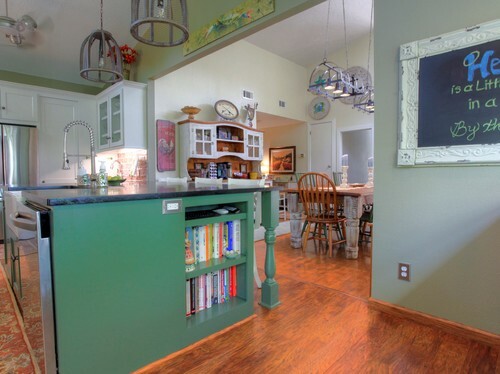 To the right of the pantry wall, the Nelsons have a beverage station with a refrigerator. The Nelsons also added a second sink in this area. 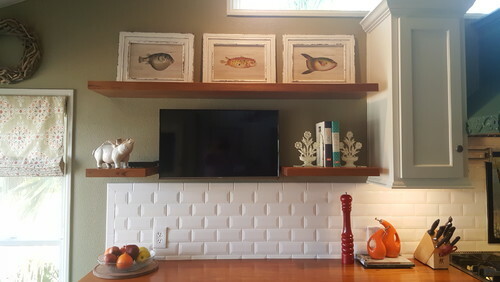 Two floating shelves in the same wood as the perimeter countertop frame the wall-mounted flat-screen TV. Having a TV in the kitchen was important to Andrew Nelson, who likes to watch sports while eating his lunch at the island. Debbie Nelson found her 48-inch range on sale at Costco. 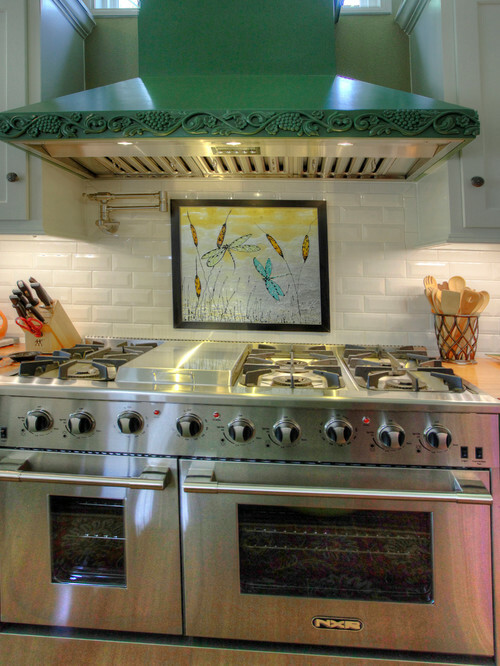 She paid $5,200 thanks to a $700-off deal, less than the $7,000 to $10,000 price tags she had seen for comparable stoves. The Nelsons had their cabinets custom-made on site and were pleased to discover that their cabinetmaker came in at a more economical rate than some of the prefabricated options from cabinet stores they’d considered. The back wall overlooks Caney Creek, a saltwater river that feeds into the Intracoastal Waterway and the Gulf of Mexico, so the Nelsons installed a large window and windowed door to take in the views. Another beverage refrigerator stands near the door that leads outside. 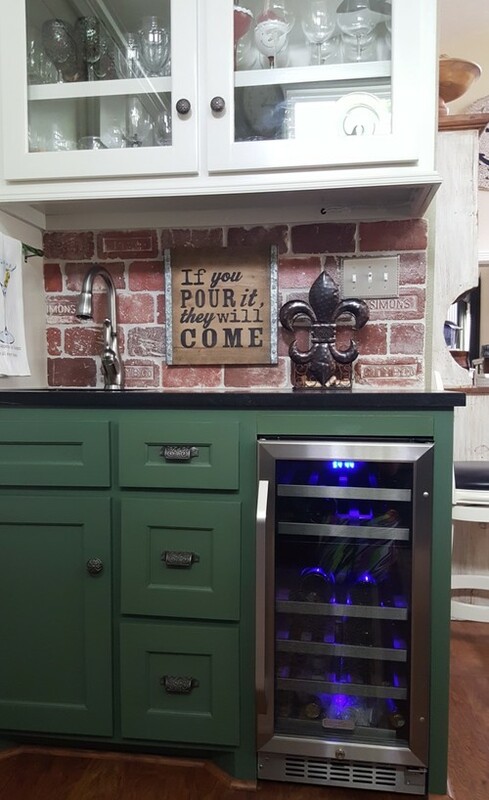 Appliances: $8,561, including $4,700 for stove, $1,304 for range hood, $798 for microwave drawer, $669 for dishwasher, $1,090 for wine and beverage cooler.